PEAKapp project partners:"User engagement linked to dynamic pricing." Members of the PEAKapp consortium have recently traveled to Bilbao in Spain to attend the third PEAKapp project meeting. 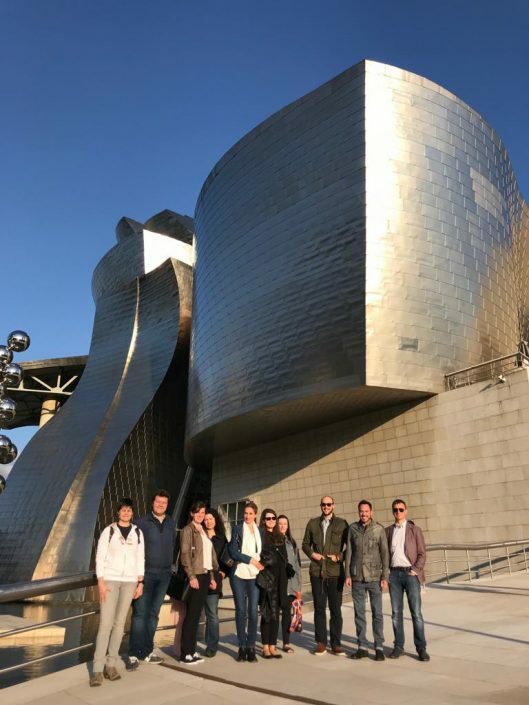 In the course of one day and a half, representatives from Energie Institute Linz (Austria), Tecnalia (Spain), ELDER (Turkey), RTDS Group (Austria), Danish Technical University (Denmark), Baskent Energy (Turkey) and 220 Energie (Estonia) discussed progress made in the last 6 months of the project and re-confirmed activity plans for the upcoming year. Particular attention was paid to the analysis of preliminary data collected from field test in Austria and to dissemination plans in order to multiply project results both during and after project lifetime. 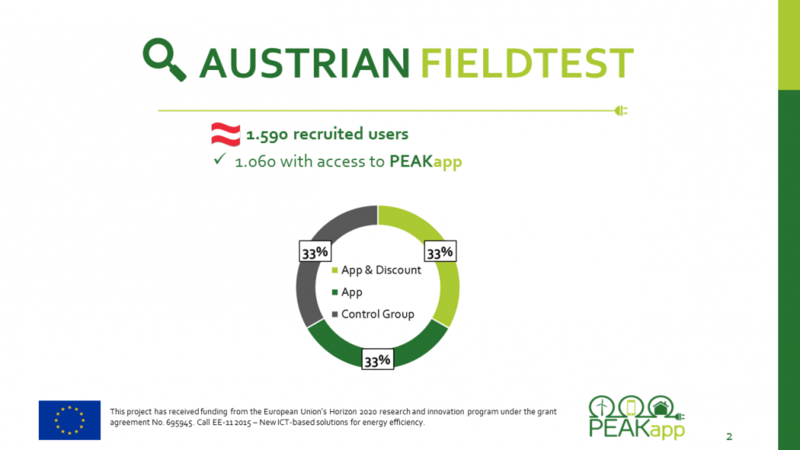 Since mid-2017, 1050 Austrian households have been testing PEAKapp. 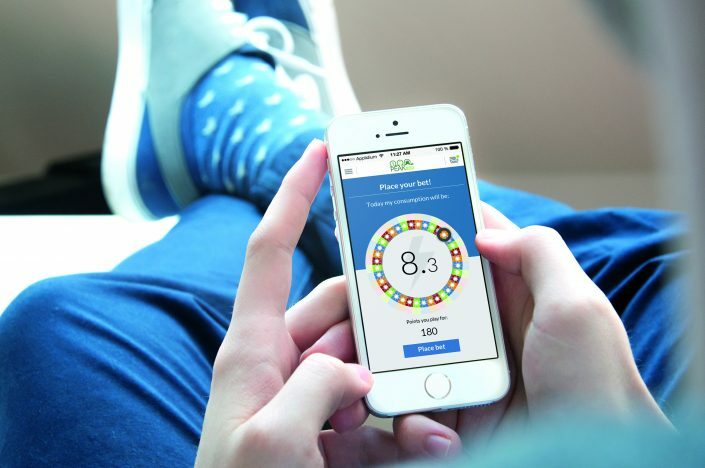 While a short analysis of the user behaviour data shows that approximately 30% of users are actively using PEAKapp, that they perform approximately 500 comparisons to similar households in their vicinity (benchmarking functionality) on monthly basis and that they regularly entertain themselves with the integrated serious game PEAKpoker, the scientific partners of PEAKapp project are eager to look deeper into behavioral change itself. Conclusions from scientific analysis of the data sets collected and processed by PEAKapp project are aimed towards presenting unprecedented research insights into what drives energy efficient behavior of European consumers. Preliminary analysis: what can we learn from user behavior? It is generally known that smartphone applications for social networking, retail & shopping and health continue to engage a large number of people of all ages and origins – but how are consumers reacting to an energy efficiency application and is a smart phone application the best tool to enduce efficient behavior? This is what PEAKapp project is trying to find out. Test users who own an electric vehicle and/or a heat pump use the app more frequently. 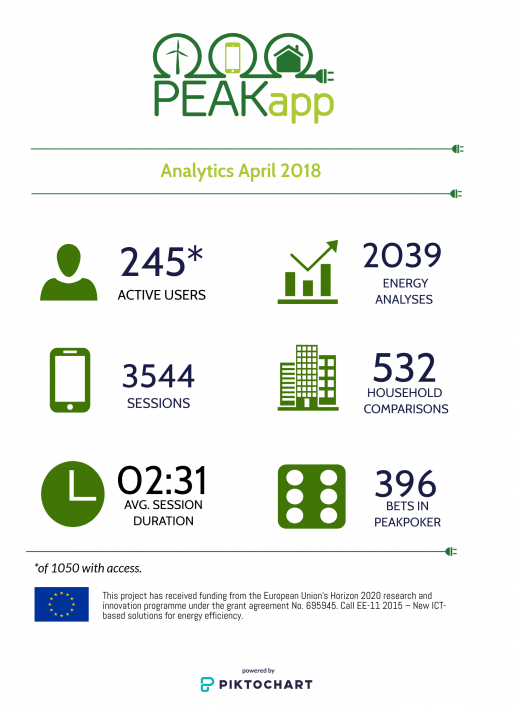 PEAKapp project has been designed to produce long-term impact in terms of contribution to energy efficiency, renewable energy consumption and behavioral change. While extensive efforts have been and continue to be made in terms of policy support, the PEAKapp project is targeting wide market uptake by the energy retailers, utilities or distributors who can adopt it and offer it to the end users. To help these objectives turning into a reality, a Market Uptake Acceleration Board (MUAB) is being formed and will act in advisory capacity to create links to potential early adopters.